We have just returned from 16 days of delightful moments at both of our homes in Italy and France. We were truly living and loving the village life. Since making our guests happy and keeping everyone up to date on all the new things we discovered on our trip is a priority for us, I have created a list here of some new experiences that we hope some (all) of you will enjoy in the near future. In Castiglione d’Orcia we spent much of the week making decisions while working with our contractor to create the new upper level terrace that has a breathtaking view over the Val d’Orcia toward Montalcino. When we did have some time for ourselves we did some wine tastings at local vineyards. New on our list to recommend is Castello Potentino, a 20 minute drive away toward Seggiano. The castle has Etruscan origins and has been in the family of novelist Graham Greene for the past two decades. Greene’s children run the operation now and we did an excellent tasting with winemaker Charlotte Horton. In addition to sangiovese, the most planted grape in our area, Horton is growing also Alicante (Grenache) and Pinot Nero (Pinot Noir). We tasted all five wines and were just knocked out especially by the Pinot Noir—just outstanding! A case was shipped home to enjoy later. 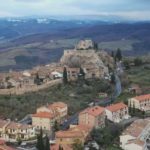 A more modest vineyard is just 10 minutes away in the tiny village of Vignoni Alto, which is just above the famed thermal spa village of Bagno Vignoni. Sante Marie di Vignoni is run by a charming couple Roma and Franco who are the winemakers, farmers and tasting room guides. In their charming cantina, they put out a spread of salumi and bread so we could experience the wines with and without food. Their sangiovese/syrah blend is excellent as is the sangiovese/merlot. Of the three olive oil varieties we chose a favorite to take home. They also ship cases to the States if you are tempted. A new restaurant for us this trip is Ristorante Daria, which is the new business of the former owner of La Porta in Montecchiello. In the same village, and just up the street, Ristorante Daria is a new fresh take on her always excellent Tuscan cuisine. We highly recommend it. Make a reservation and pay in cash to get a small discount. 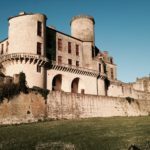 In Duras, as in Castiglione d’Orcia, there is a full list of annual and summer season events that can be accesses on the visitor websites, www.paysdeduras.com, and on the Facebook pages for the villages of the Val d’Orcia. Like Pro Loco Castiglione d’Orcia for all local events.